This is another method where one person can help another. This time by touch with the hands. 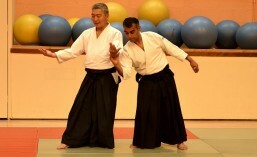 Tohei Sensei wrote the book “Kiatsu” which covers this subject in more detail but since then his organisation has made the word a registered trade mark so we now call this aspect of the practice Teateho, or the method of placing the hands. We learn to trace and discover areas of another’s body, particularly in the muscles, which have some tension or discomfort. By learning how to press correctly with the fingers we can move along the affected areas to help the muscles to relax and to help relieve the problem. The practitioner must be able to be calm and relaxed and to extend positive feelings to the affected areas. This is not a therapy. It is just a means whereby one person tries to help another and no payment is ever made or received. Although not fully understood, the placebo and nocebo effects are well documented in medical literature. The imagination of an individual can affect their physical systems and the progress of some medical conditions: the mind can influence the body. The autonomic systems of the body also control healing. If we cut ourselves our bodies heal the cut. If we have surgery the surgeon may remove a damaged part but the body’s autonomic system will mend the surgical damage, healing the surgeon’s scalpel incisions and the internal surgical wounds. By outside stimulation Teateho tries to encourage the individual’s capacity to heal themselves. To a certain extent we can apply Teateho to ourselves but perhaps the best way we can assist self-healing is by practising Kokyuho and Seizaho. It is well-known that anxiety stresses the body’s systems, raising blood pressure, increasing heart rate and more. This interferes with the work of the body’s own systems of repair and recovery. It is beneficial if we can, at the very least, remove this stress by the relaxed calmness arising from our Kenkodo practise and enable our autonomic systems to function at their best without interference.